By admin | December 4, 2012. 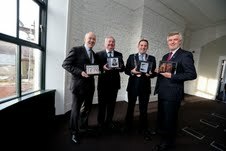 Philip Flynn, Minister Pat Rabitte, Lord mayor of Dublin Naoise Ó Muirí and John Tierney at the launch of the new Digital Hub offices. The Lord Mayor of Dublin opened the Digital Hub’s new offices at an event attended by the Minister for Communications, Pat Rabbitte. Townhouse Twenty2, located at 22 Thomas Street, is the name of the new offices designed for digital businesses. The five storey building was redeveloped, but as a protected structure it retains its historic features. This is the seventh building run by the Digital Hub and opened on 26 November; its redevelopment cost roughly €800,000. The building is a protected structure due to its historic past; in May 1798 the building provided refuge to Lord Edward Fitzgerald, just prior to his arrest for his part in the 1798 rebellion. In the 1800s it was taken over by Dublin City Corporation and became one of Dublin’s first lending libraries. It served as a library until 1983; then served tourists as the Brewery Hostel until 2008. Speaking at the official opening Lord Mayor of Dublin, Naoise Ó Muirí, said: “This building originally served as a townhouse in what was then one of the city’s most vibrant commercial locations. Although Dublin 8’s commercial activity declined during the 20th century, the area is once again making its mark on the national economy. “At the same time there are an increasing number of social, cultural and educational amenities opening nearby. The redevelopment of this building will contribute in a very tangible way to the local economy,” he added. Pat Rabbitte, Minister for Communications, and City Manager, JohnTierney, also attended the opening. Minister Rabbitte described the offices as “a solid investment for the Digital Hub”. According to CEO of the Digital Hub, Philip Flynn, the Digital Hub is at full occupancy so this new space was needed. “We’re already in advanced negotiations with a number of prospective tenants and we expect the building to be fully occupied within a matter of months,” he said. The Liberties community representative for the Digital Hub, Seamus Ratigan, described the new offices as very positive: “Philip Flynn, John Tierney and the Lord Mayor are committed to the development,” he commented. However, he also described the need for a continual link between the Department of Communications and the Digital Hub so that plans are guaranteed to be continued in the future. “It is a national asset, as well as an asset for Dublin,” Mr Ratigan added. Eric Byrne,Labour TD for Dublin South Central, also attended the opening. “This building is a great example of progress being made in Dublin 8. All of this good news in a time of economic depression is a phenomenal boost to the morale of the people living in the area,” he said. The Digital Hub also has planning permission for Vathouse Seven on Crane Street, but is waiting for investment to begin refurbishments.